Oxford Scholarly Editions Online (OSEO) features authoritative online editions of original works by some of the most important writers and philosophers in the humanities, from William Shakespeare to William Wordsworth, Jane Austen to Charles Dickens, Thomas Hobbes to Horace. Whilst preserving the traditional link with print, OSEO has broken the print editions apart to put the texts themselves front and centre, making them fully accessible to students and scholars worldwide. Two hundred years ago, on 16 June 1816, one of the most remarkable gatherings in English literary history occurred in a villa just outside Geneva. Present at the occasion were Lord Byron, who had left England in April to escape (unsuccessfully, in the event) the scandal surrounding his separation from Lady Byron; John Polidori, whom Byron had engaged as his personal physician; Percy Bysshe Shelley; the eighteen-year-old Mary Wollstonecraft Godwin, with whom Shelley had eloped two years earlier and whom he was to marry in December 1816 (after the suicide of his first wife, Harriet Westbrook); and Godwin’s eighteen-year-old stepsister Claire Clairmont, who was hoping to resume a relationship with Byron that had begun in March (resulting in her pregnancy) and ended with his departure for the Continent. As Mary Shelley recalled in 1831, the group, confined by “incessant rain” to Byron’s rented villa in Cologny, had been reading Fantasmagoriana, a collection of ghost stories translated from German into French, when Byron proposed that each (possibly excluding Clairmont) should write an original ghost story. The next day Polidori recorded in his diary, “The ghost stories are begun by all but me.” Percy’s story, which Mary remembered to have been “founded on the experiences of his early life”, was soon abandoned and is now lost. Byron’s, about a tormented and dying aristocrat called Augustus Darvell, was also soon abandoned, but the fragment was published as a pendant to his verse tale Mazeppa in 1819. Polidori’s story, begun on 18 June, involved, according to Mary’s later account, “some terrible idea about a skull-headed lady, who was so punished for peeping through a key-hole”. Nothing fitting that description survives, but Polidori was stimulated by his employer’s fragment to write another story, whose sinister protagonist Lord Ruthven takes his name from the thinly veiled Byronic figure of Lady Caroline Lamb’s Gothic roman-à-clef Glenarvon (1816). Published in the New Monthly Magazine on 1 April 1819 with a false attribution to Byron and an anonymous introductory note revealing the basic facts of the ghost-story contest, Polidori’s “Vampyre” marked the first appearance of a vampire in prose fiction, thereby initiating a subgenre of the Gothic that remains popular today. Finally, Mary Godwin’s story, deriving from her dream about a “pale student of unhallowed arts kneeling beside the thing he had put together”, grew over the following months into a novel, which was published anonymously in three volumes in 1818: this was, of course, Frankenstein, now widely considered the first work of science fiction. Reverberations of the June 1816 discussions of the supernatural and the nature of life, conducted at the Villa Diodati over several days of exceptionally miserable weather, can be discerned in two remarkable poems that Byron composed in July or August of that year, before the Shelley part departed for England on 29 August. Although neither poem refers to Christianity, both indirectly challenge Christian soteriology—the doctrines of Christ’s redemption of humanity from sin and of eternal life—by presenting visions of a world in which and from which there is no possibility of salvation by divine agency. 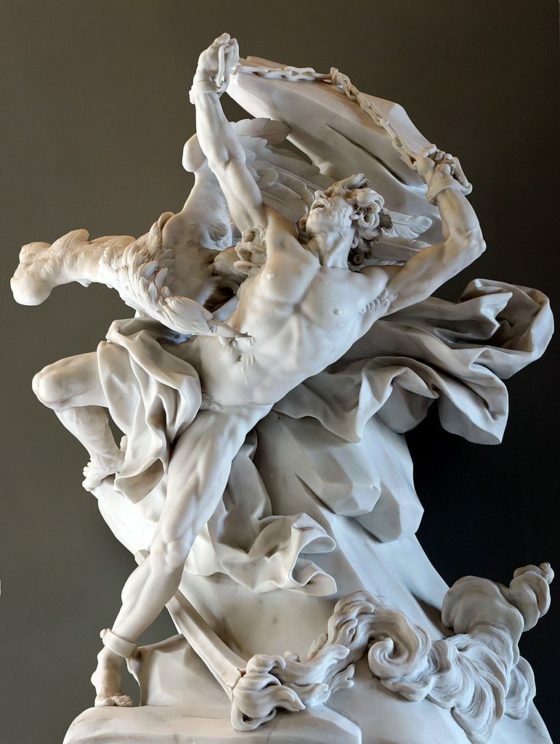 Prometheus depicted in a sculpture by Nicolas-Sébastien Adam, 1762 (Louvre). Public Domain via Wikimedia Commons. Like Mary Shelley, the subtitle of whose novel is The Modern Prometheus, Byron appropriated and radically transformed the myth of the Titan god punished by Zeus for giving fire to mankind and thereby depriving the gods of its exclusive possession. Although Victor Frankenstein may represent, as Shelley herself put it in her 1831 introduction to the novel, the “human endeavour to mock the stupendous mechanism of the Creator of the world”, he is punished not by God but by his own creation, and for refusing to create a second creature as its mate—not for transgressing on divine prerogative, in other words, but for being insufficiently transgressive. In Byron’s “Prometheus”, prompted by Percy Shelley’s translating aloud from Aeschylus’s Prometheus Bound, the Titan’s gift loses nearly all its sense of transgressiveness against divinity because humanity already possesses, in the consciousness of its mortality, what Prometheus’s very name means in Greek, foresight: “Like thee, Man is in part divine, / A troubled stream from a pure source” (lines 46–7). Thus Prometheus, whose “Godlike crime was to be kind” (line 34), can do little more than “render with [his] precepts less / The sum of human wretchedness” by teaching us how to suffer with dignity, thereby “making Death a Victory” (lines 36–7, 59). In this condition of unrelieved cold and darkness, social hierarchies dissolve and the trappings of civilization are destroyed (palaces and modest huts alike “burnt for beacons”) as, the earth having become infertile (“a chaos of hard clay”), famine spreads and people turn against one another in a vain struggle to survive. Finally, all light having been extinguished and all life having expired, only Darkness remains: “She was the universe” (line 82). Various sources of the poem have been suggested, from the Bible (especially Jeremiah 4:23–8) to Lucretius’s account of the Athenian plague of 430 B.C. (De rerum natura 6.1138–286). Recent commentators have noted that the darkness, cold, and barrenness conjured up in the poem corresponded to actual conditions in 1816, which became known as the “Year without Summer”. Ash particles and sulphur dioxide from the eruption of Mt Tambora in Indonesia in April 1815—the most powerful volcanic eruption in recorded history—had spread round the world, dimming the sun for months and reducing average global temperatures. The resulting crop failures led to severe food shortages and civil unrest in some European countries: “Seasonless, herbless, treeless, manless, lifeless” indeed (line 71). Yet “Darkness” makes no direct reference either to contemporary events or to the biblical Apocalypse, and for exactly that reason it seems at once mysterious and applicable to situations that Byron couldn’t have imagined. In the 1980s, for example, the poem was occasionally interpreted as a prophecy of nuclear winter, and twenty years later (by Jonathan Bate) as a prophecy of “ecocide”. Perhaps, indeed, the Promethean Byron is offering us a vision of the future that awaits us, the burners of fossil fuels, as we begin, in June 2016, what promises to be the hottest summer on record. Featured image: ‘Castle in thunderstorm’ by Dieter_G. CC0 Public Domain via Pixabay. Nicholas Halmi is Professor of English and Comparative Literature at the University of Oxford and a Fellow of University College, Oxford. He is the author of The Genealogy of the Romantic Symbol (OUP, 2007) and the editor, most recently, of the Norton Critical Edition of Wordsworth’s Poetry and Prose (2013). He is an editorial board member for Oxford Scholarly Editions Online.